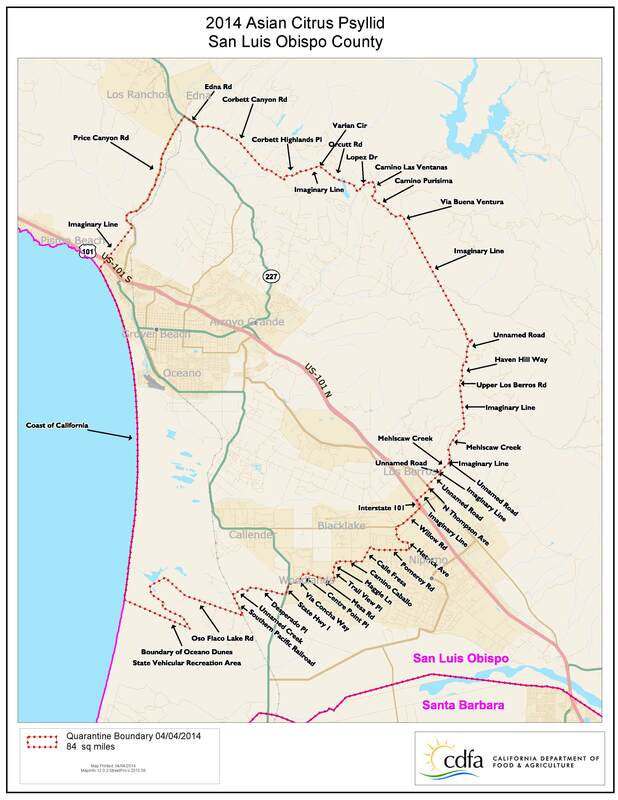 TODAY, the California Department of Food and Agriculture (CDFA) defined the borders of the 84 square mile-quarantine zone, following the detection of one Asian citrus psyllid (ACP) in the Arroyo Grande area of San Luis Obispo County. The zone is bordered on the north by Corbett Canyon Road; on the south by Oso Flaco Lake Road; on the east by Mehlscau Creek; and on the west by the coast of California. The quarantine map is below. The quarantine prohibits the movement of citrus and curry tree nursery stock out of the quarantine area and requires that all citrus fruit be cleaned of leaves and stems prior to moving out of the area. An exception may be made for nursery stock and budwood grown in USDA-approved structures designed to keep ACP out. Residents with backyard citrus trees in the quarantine area are asked not to transport fruit, citrus or curry leaves, or potted trees from the quarantine area. ACP quarantines, in addition to San Luis Obispo County, are now in place in Imperial, Los Angeles, Orange, Riverside, San Bernardino, San Diego, Santa Barbara, Ventura and portions of Fresno, Kern and Tulare Counties. A total of more than 46,420 square miles are under quarantine. << Previous post: California Drought Puzzle: Store or Conserve More Water?